“Tosca” again. Los Angeles Opera is winding up its season at Dorothy Chandler Pavilion with it. Sunday afternoon, Puccini’s little killing spree packed them in as it always seems to. The production has extra blood and two intermissions at normal prices. Click here to read my review (subscription or one day pass required), or pick up a copy of Thursday’s newspaper. « Review: L.A. Philharmonic, Dudamel perform in O.C. Cavaradossi’s execution was actually quite graphic too, with the blood spurting out quite a few feet, but I doubt anybody could see it unless you were sitting on the extreme right side of the DCP and not too far back (like happened to be). I wonder if they got rid of that Sunday, when I saw it. I saw no red, at all. Thanks! I love your writing and this review was a good read. 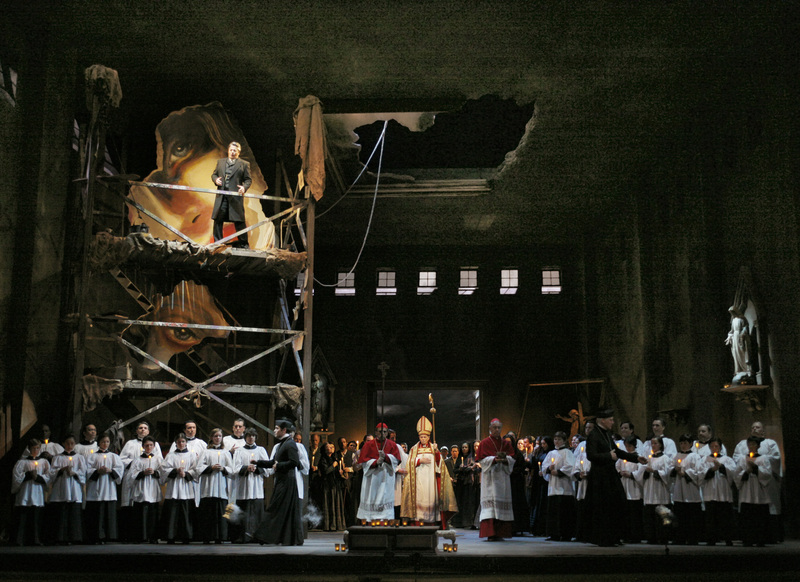 From 2013 … LA Opera is reviving it right now. “(personally, you can have it)”!! I appreciated Tosca a lot more after reading the Sardou play, myself. I understood her much more. That said, clicking your link got me access to the full review.